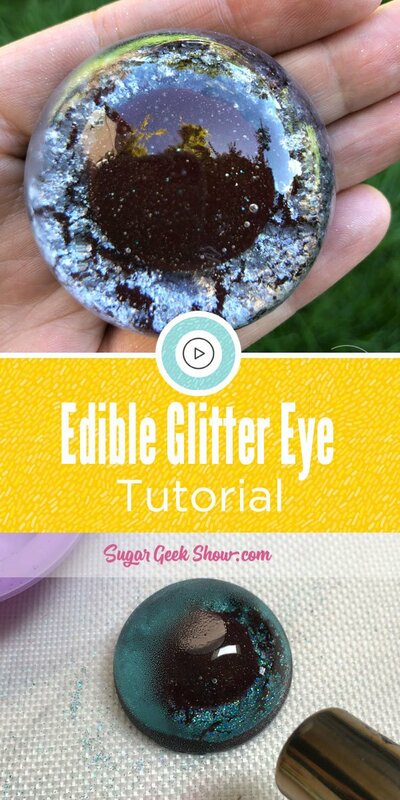 These edible glitter eyes are perfect for using in your whimsical sculpted cakes. 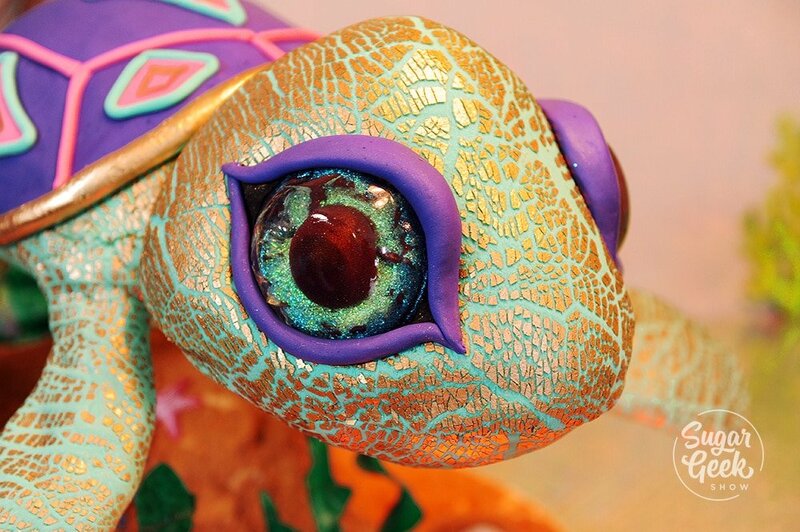 I first made these eyes for a gravity defying sea turtle cake for my friends daughter’s birthday which HAPPENED to be filmed for an upcoming episode of Ridiculous Cakes on Food Network. Tune in on June 9th 10:30pm | 9:30c to see how the cake came together. 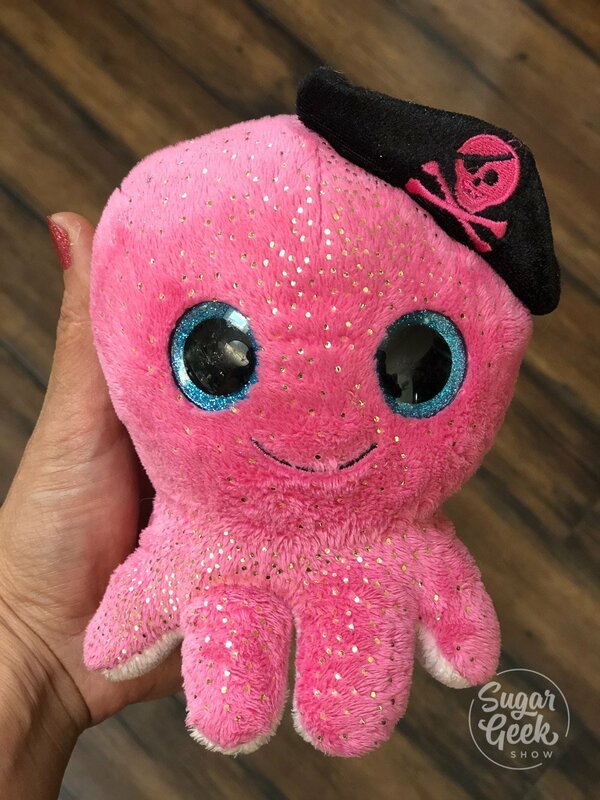 I was originally inspired to make these eyes from looking at my daughter’s toys. She LOVES the pretty glitter eyes and has about a billion different versions. Seriously, she needs a beanie boo intervention. When my friends daughter asked for a beanie boo turtle cake for her 3rd birthday, I was stoked to finally figure out how to make these babies out of sugar! I went through a LOT of trial and error. Cracked isomalt, bubbles, imperfections but finally, I figured out a process that was repeatable and pretty goof-up proof. 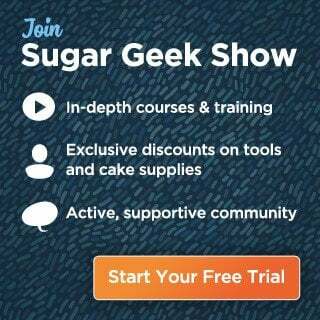 Start by melting your clear isomalt. I melt mine for 30 seconds at first and then in 10 second increments until liquid. Make sure you wear hand protection because that isomalt gets HOT. Let the bubbles settle down. Color a small amount with a drop of black food coloring. 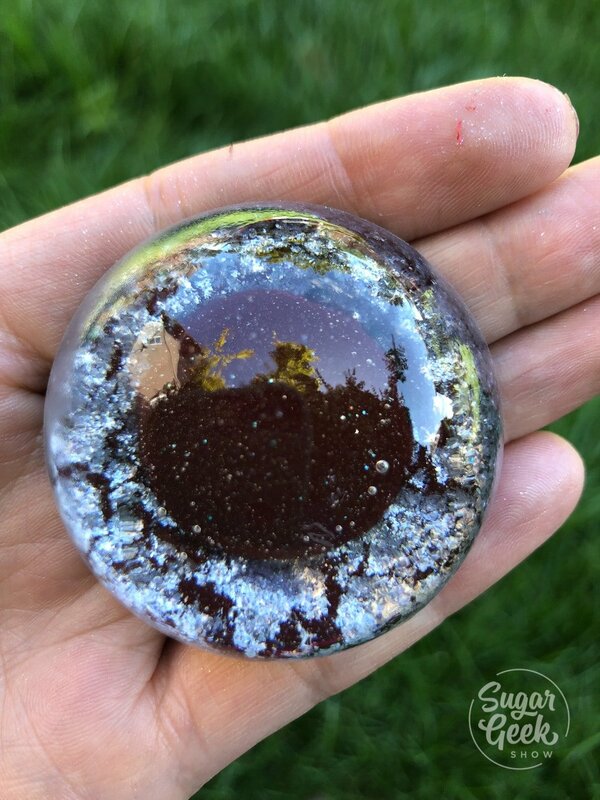 Pour the black isomalt into the second from largest sphere from the cabochon mold. Let it cool then torch the surface so it’s free of bubbles. 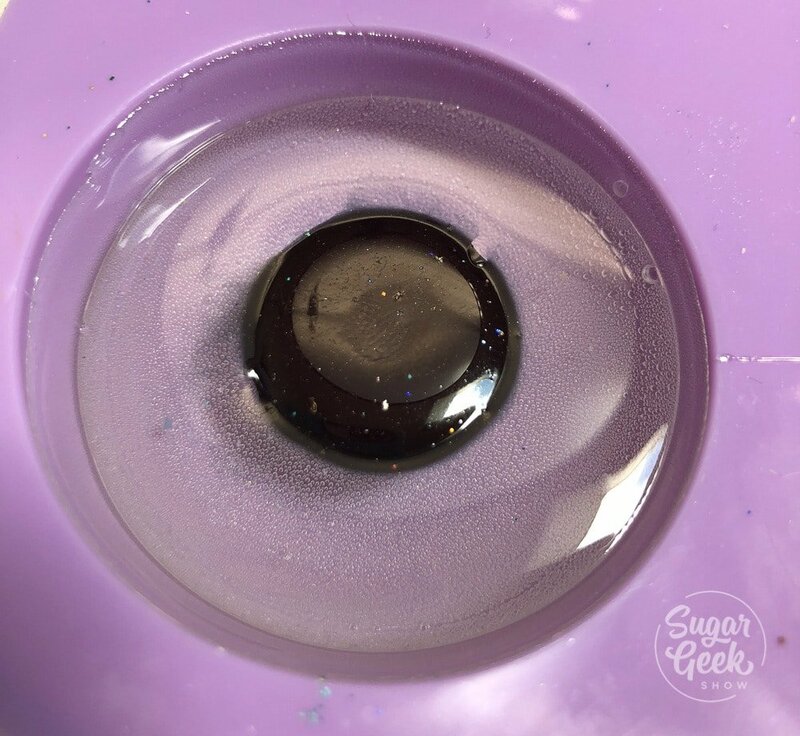 **tip** when re-melting isomalt, go in 10 second increments to prevent over-heating or burning. Never fill your cup more than half way to prevent getting burns. 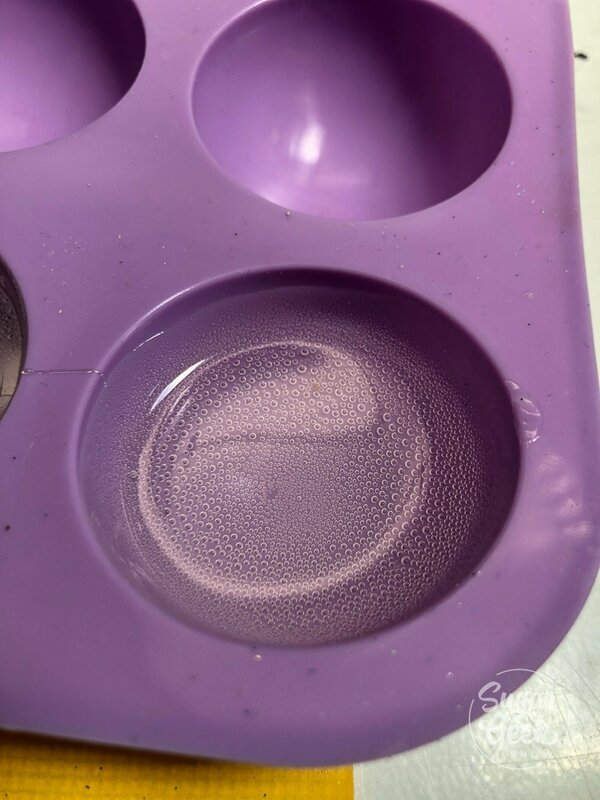 Fill your silicone sphere mold halfway with clear isomalt and rotate the mold so the liquid coats the sides of the mold. This way you don’t get a seam in the side of your eye. Let it cool. Pour more clear isomalt into the remaining space of the mold half way. 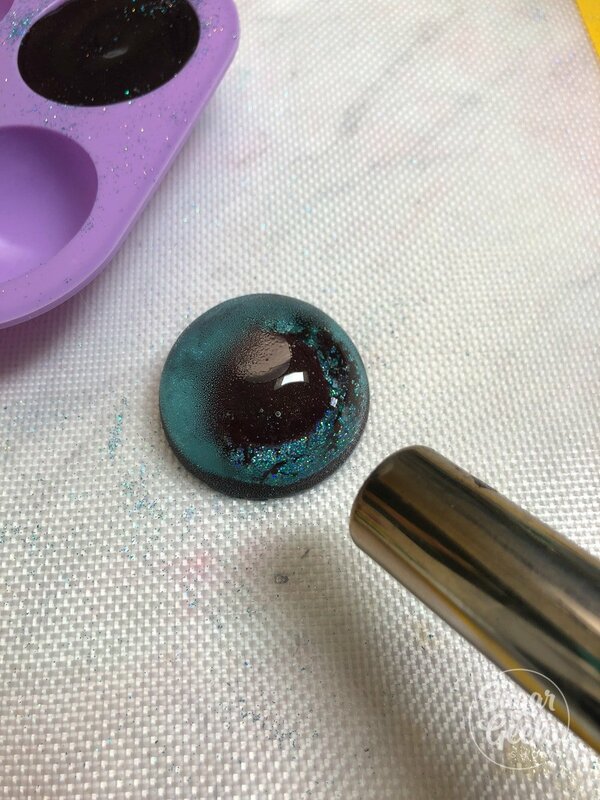 Place the black isomalt sphere in the center. Use the tip of a knife to position it so you don’t burn your finger. 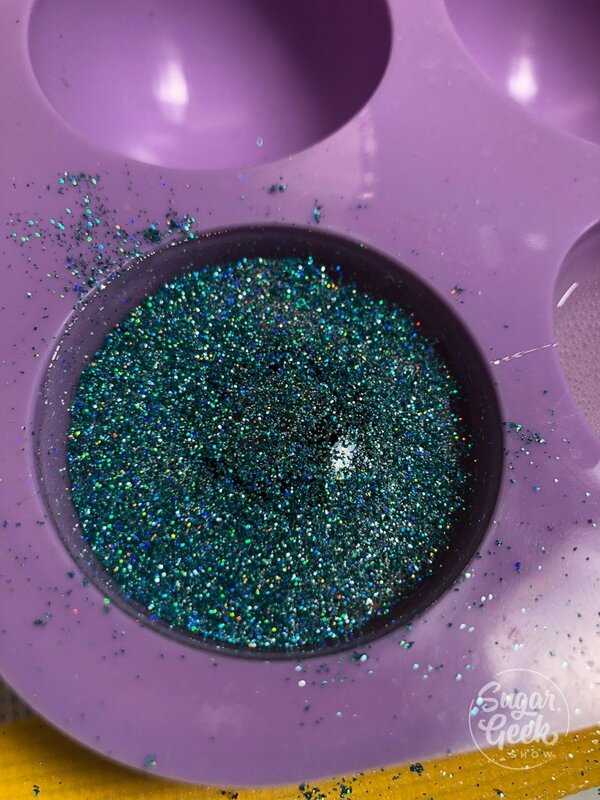 Sprinkle some edible glitter onto the surface. Let cool a couple of minutes then cover the surface with some more black isomalt. Let cool. 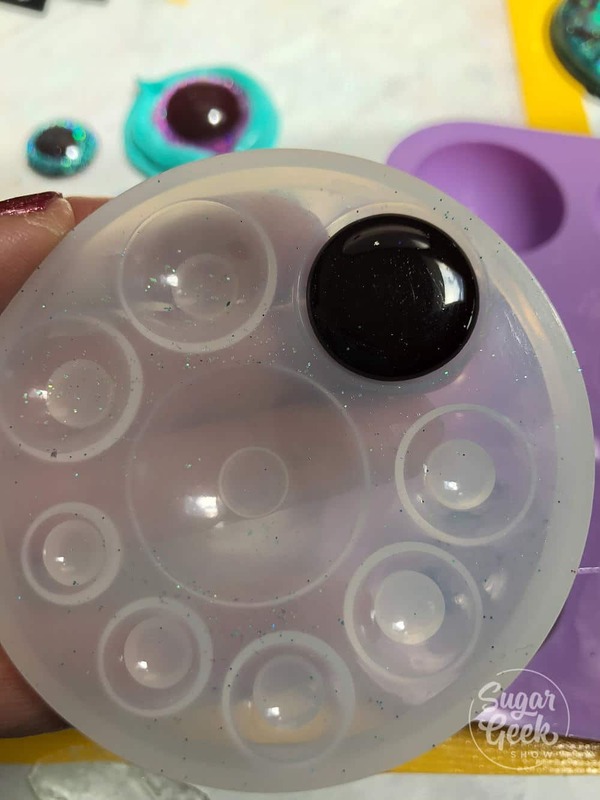 Remove the eye from the mold and torch the surface to remove the bubbles. Place eye in a spare container and spray with cake gloss to keep it shiny. 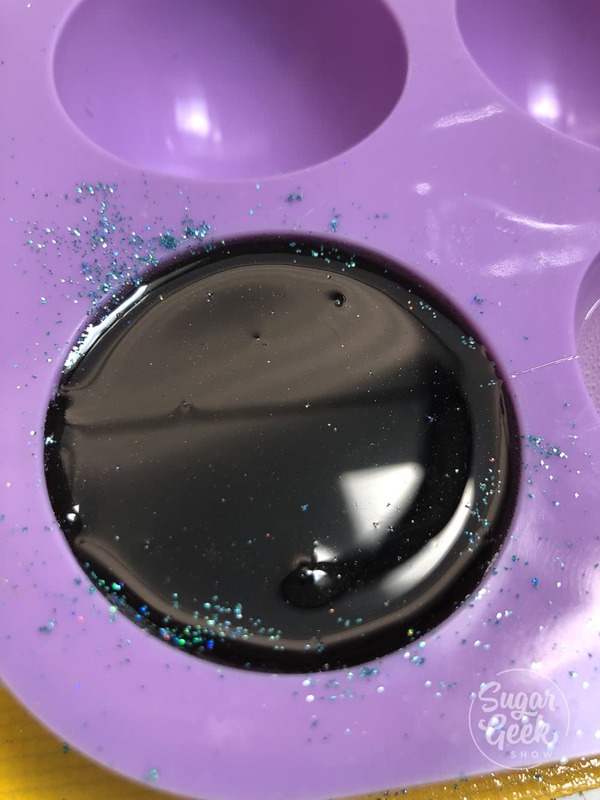 You can now use your awesome glitter eyes for your next cake project! Let me know if you liked this tutorial in the comments or if you have any questions and don’t forget to tune into Food Network and watch us create these awesome eyes for our giant gravity defying turtle cake! Amazing. Absolutely beuotulf and hooray and thank you. I so love this as We love love love the big sparky eyes and I can put them on CAKE. (Jump for joy). Just in awe of all you creations !! So amazing!!! I’m hoping to make this for my daughters birthday in November 🤞🏽Question, type of glitter did you use? And would you ever sell them pre-made? How long can these be made ahead of time? Thanks for this great tutorial! Unfortunately, I thought my trusted cake supply store would carry the glaze, but I was wrong. Is there a substitute that would seal them? Even with good ole’ prime I don’t think I can order it in time. Thank you!